A LOOMING food crisis in the world and high food inflation rates at home made Pranab Mukherjee’s proposals to boost agriculture in his 2011 budget more keenly watched than usual. These are factors that clearly weighed with the finance minister who repeatedly said that his principal concern this year has been the continuing high food prices. The squeeze on the consumer who did not benefit from the seasonal fall in prices was a recurring theme in his speech. But did the deepening agrarian crisis in the country which has seen no let-up in the number of distressed farmers taking their own lives determine his allocations? Going by the reactions of farmers’ organisations and agriculture analysts to his proposals, the finance minister, it seems, has not kept the farmer at the centre of his formulations. The domestic landscape has been darkened by freak weather in several parts of the country where frost and unseasonal and heavy rains have laid waste farmlands in half a dozen states. 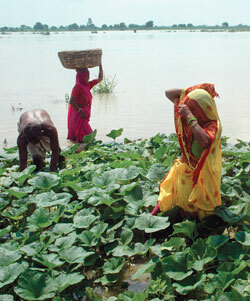 According to one estimate, crops in 7.5 million hectares have been destroyed in Andhra Pradesh, Odisha and Tamil Nadu. In past weeks, farmers in Madhya Pradesh, normally not high on the suicide index, too took their own lives after frost destroyed their crops. So although Mukherjee announced a range of measures to keep up the momentum in agriculture, which has grown at an estimated 5.4 per cent during 2010-11 after two successive years of dismal growth (1.6 per cent in 2008-09 and 0.2 per cent in 2009-10), no one is cheering. Yudhvir Singh, general secretary of the Bhartiya Kisan Union, says the budget has completely upset farmers. “There is nothing for the Indian farmer in the budget,” he declares, dismissing even the increase in interest subvention from 2 per cent to 3 per cent as of no significance. The other big farmers’ organisation, the Bharat Krishak Samaj (BKS), is unhappy, too. “The budget misleads more than it reveals. The allocation for the agriculture sector is far below our expectations,” is the terse comment of its chairperson Ajay Jakhar. But first, a look at the main incentives that Mukherjee is offering the sector. The eye-popping number is the huge step-up in agricultural credit. The budget raises the target of credit flow to farmers from Rs 3,75,000 crore this fiscal to Rs 4,75,000 crore in 2011-12, and the minister says banks have been asked to step up direct lending to small and marginal farmers. This is an almost 25 per cent jump in credit. The other is the allocation from the Rashtriya Krishi Vikas Yojana (RKVY), which is being increased from Rs 6,755 crore to Rs 7,860 crore. RKVY is intended to maximise returns to farmers by getting states to increase their investment in this sector. Yet, “the budget lacks a vision and a strategy for keeping farmers on the farm,” laments eminent agriculture scientist M S Swaminathan who has been campaigning for long to provide income security to India’s poor and marginal farmers. “While the finance minister has emphasised the need for reaping a demographic dividend from our youthful population there is no strategy or programme for attracting youth to farming.” The various reports produced by the National Commission on Farmers that he headed, including a National Policy on Farmers, has been gathering dust. An immediate concern of the farmers is credit. Jakhar says the credit policy is misleading because “it is generally believed that this humungous amount (Rs 4,75,000 crore) will be dispersed to farmers at a subvention inclusive rate of 4 per cent. This is incorrect.” Increasingly, loans to farmers constitute a very small part of what is shown as agricultural credit. Since 1993, indirect loans have been treated as agricultural loans as the definition has been broadened to include even the loans given to the state electricity boards for putting up wires and to dealers of companies selling agriculture-related products to farmers. Banks have thus been claiming a huge proportion of farm loans is a write-off. “Thorough verification of bank records is needed to check if the banks are showing non-agriculture loans as agriculture loans. Details of how much money is being dispersed as cash loans to the farmers at a reduced rate must be revealed in the Budget. Only then will the true picture emerge,” insists the BKS chief. 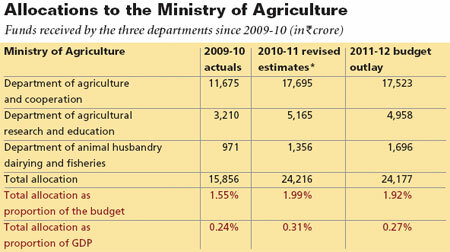 So, overall is the budget a washout for the agriculture sector? Nilachala Acharya, analyst with the Centre for Budget and Governance Accountability (CBGA) in Delhi, worries that the expenditure on agriculture as a percentage of the total budget is showing a marked decline. From a high of 15.7 per cent in 2008-09, allocations have come down to 10.3 per cent and as a percentage of GDP (current market price) it has slumped from 2.5 to 1.4 per cent. In fact, the hike in RKVY is not all that significant considering that the government had intended to disburse a total of Rs 25,000 crore under the scheme during the 11th Plan which ends this fiscal. The total allocation even with the current hike takes it to just 90 per cent. Acharya’s complaint is that the so-called new schemes, such as the Rs 300 crore for millets, are all part of RKVY. Besides, the allocations for many of the programmes which should have received a huge boost are woefully inadequate, specially the funds for ushering in the new Green Revolution. CBGA’s calculations show that the Rs 300 crore earmarked for 60,000 pulses villages in rainfed areas would mean an average allocation of just Rs 50,000 per village. However, the Rs 300-crore millet programme in 25,000 villages (covering one million farmers in 1,000 compact blocks) may fare better with each village getting Rs 1.2 lakh annually. The general verdict is that a trickle of funds is unlikely to result in a bumper harvest, either for the farmer or for the country.